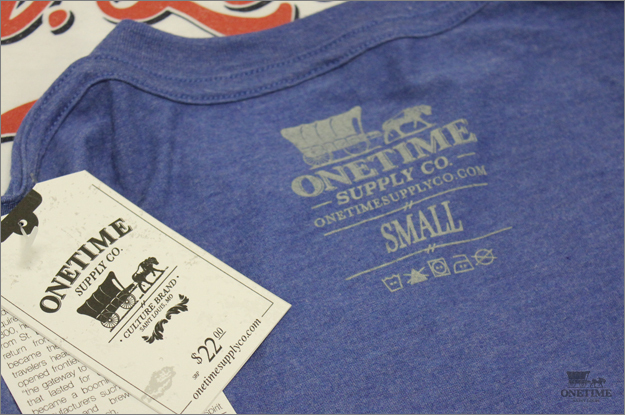 About// On Printed Tags — Onetime Supply Co. Since I began my journey in screen printing, I’ve always been in a mindset of learning from the perspective of printing apparel for retail. More specifically—I aim more for finesse, clean lines, and good texture. It’s no secret that Im approached by and speak to clients wishing to begin or continue their own clothing lines for themselves but I often seem to forget about this service option that would be wildly relevant: screen printed tags. Most of the time I design them based off of what ever information or design is required to be included in the tag, but there are instances where the client feels comfortable enough to design the tag themselves. Being knowledge about some of the many intricacies that go into screen printing size tags is important for any professional providing the solution, such as: suggested ink color, ink viscosity, stroke pressure, verbiage, and proper placement. To say that I've "mastered it" would be quite pretentious of me, but I have a pretty good handle of the best practices and what to avoid.